The City of Omaha is now considering building a Streetcar System for an estimated cost of $156 million. 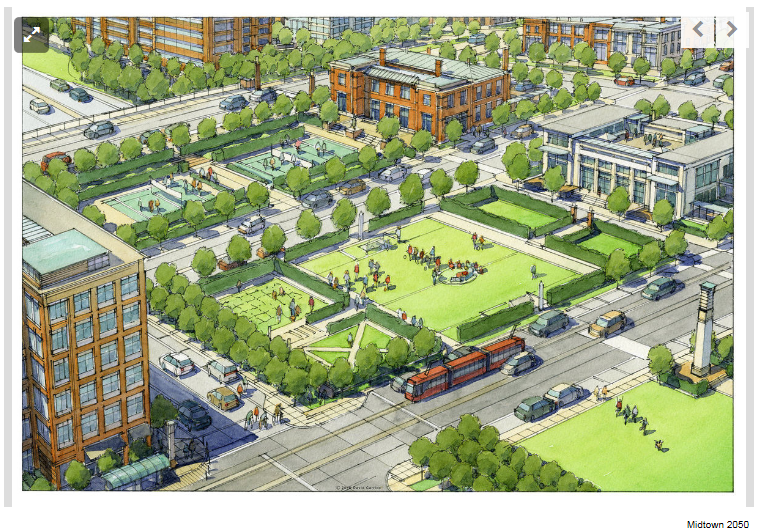 Both of the two mayoral candidates have endorsed this proposal. It would run from TD Ameritrade Park in downtown Omaha to 42nd and Farnam Streets in midtown Omaha, a distance of about four miles. It would cost about $7.5 million per year to operate the line and would generate about $700,000 a year in annual revenue with a fare of $1.25 per ride. Adding a fee of $1.50 per ticket per College World Series event (at TD Ameritrade Park) would generate about $500,000 per year in additional income. The financial assessment of the project by HDR suggests that the Federal Transit Administration could be asked for a grant of $78 million, or one-half of the total cost. The FTA is already contributing $15 million towards a $30 million Bus Rapid Transit system along Dodge Street approved by the City Council. The BRT involves 27 sleek, modern bus stop shelters along the route at a cost of $260,000 each. The FTA has an annual budget of $19 billion. The Trump Administration is asking for a $2.4 billion cut in the FTA budget for 2018. Congress has not yet taken any action on the Trump Budget proposal. But the FTA budget is clearly funding extravagant local projects around the country and is ripe for a major budget cut. Conclusion. Omaha is simply not large enough, nor with a sufficiently dense population base, to support a downtown street car system aimed at the tourist trade. It could only be financed with massive federal support at a time when the federal government is rightly trying to cut back on unnecessary and wasteful spending. Don’t do it, Omaha! My last post is highly critical of the economist and New York Times columnist, Paul Krugman, for encouraging massive new deficit spending to stimulate our under-performing economy. Debt and the slow growth of our economy are the two main topics of this blog which I have now been writing for almost four years. How to speed up growth is a complicated and highly charged political issue about which reasonable and well informed people can differ. However avoiding excessive debt is to me a moral issue whose resolution should not be that difficult, at least in a conceptual sense. Our public debt (on which we pay interest), now about $13 trillion, is 75% of GDP, the highest since right after the end of WWII. And it is projected to keep getting steadily worse under current policy. 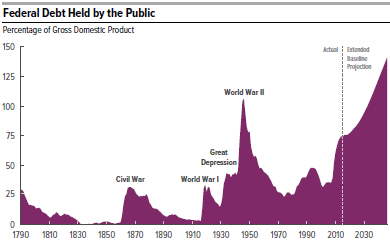 Note the decline in the debt from the end of WWII until about 1980. This doesn’t mean that the debt was actually paid off but rather that it shrank as a percentage of GDP as the economy grew fairly rapidly during this time period. From 1980 – 2008 the debt level fluctuated and increased somewhat but did not get badly out of control. Debt shot up rapidly with the Great Recession and has been continuing to grow ever since. The current GDP of our economy is about $19 trillion. At a current growth rate of 2.1%, this adds $400 billion of GDP per year. This means that a $400 billion deficit for 2016 would stabilize the public debt at 75% of GDP. But our 2016-2017 deficit is projected to be almost $600 billion (and rising). This is not good enough! Conclusion. In order to begin to shrink the size of the public debt, it is imperative that annual spending deficits be reduced to well below $400 billion per year. This will be difficult for our political process to achieve but it is the only way to avoid a new and much worse financial crisis in the relatively near future. This blog is about the major fiscal and economic problems of our country and specifically our stagnant economy (2% real growth for the past six years) and massive federal debt (the public debt, on which we pay interest, is 74% of GDP, the highest since WWII). My major sources of information are the New York Times and Wall Street Journal but I also make use of reports from various think tanks. 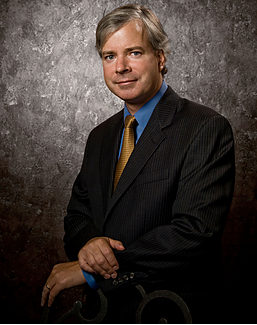 Today’s source is the recent report, “Why the Federal Government Fails,” by the Cato Institute’s Chris Edwards. Top-Down Coercion. Federal agencies impose more than 3,000 regulations each year. Total regulations now span 168,000 pages. Benefits are distributed through more than 2,300 programs. Federal policies are often based on guesswork. Failed policies are seldom weeded out because they are funded by taxes and are not contingent on performance. Lack of Knowledge. Private markets operate efficiently on the basis of price information. Government subsidies and regulations throw a monkey wrench into the price mechanism. Political Incentives. Congress focuses on the benefits of programs but does not consider the full costs because benefits are delivered to narrow groups while the costs are spread widely. There are too many fiscal illusions to hide costs such as: paying with debt rather than higher taxes, taxing businesses which then just raise prices, conferring benefits by regulation (e.g. requiring employers to provide healthcare) rather than direct subsidy. Bureaucratic Incentives. There are too many rewards for inertia and not enough for the creation of value such as the absence of profits and losses, rigid compensation, lack of firing, red tape, agency capture, etc. Hugh Size and Scope. The $4 trillion annual budget is 100 times the average state budget of $40 billion. It is simply too vast for members of Congress, and other top officials, to understand what is going on. The more programs the government has, the more likely they will work at cross-purposes. Mr. Edwards concludes that “the most important way to improve federal performance would be to greatly cut the government’s size” and to do this by shifting federal activities back to the states. With this recommendation I heartily agree! Often I will respond, it is up to Congress to figure this out. The important thing is to shrink the deficit one way or another. It doesn’t matter from a fiscal point of view exactly what is cut. 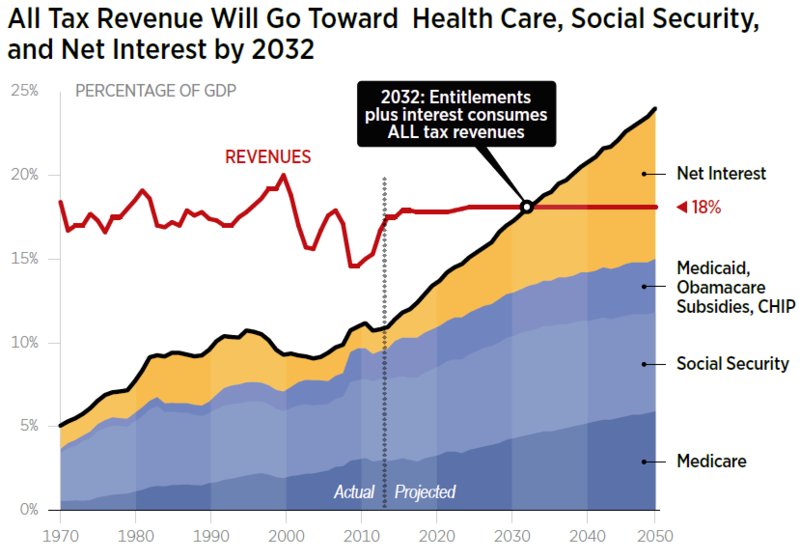 Another answer I like to give is that with the sequester already slowing down discretionary spending, we should concentrate on finding savings in entitlement programs like Social Security, Medicare and Medicaid. While both of these answers have validity in a general sense, nevertheless I do look for ways to cut back on discretionary spending as well. Here is a good idea from Reason magazine’s Veronique de Rugy, “Let States Build Their Own Highways.” The rationale is very simple. 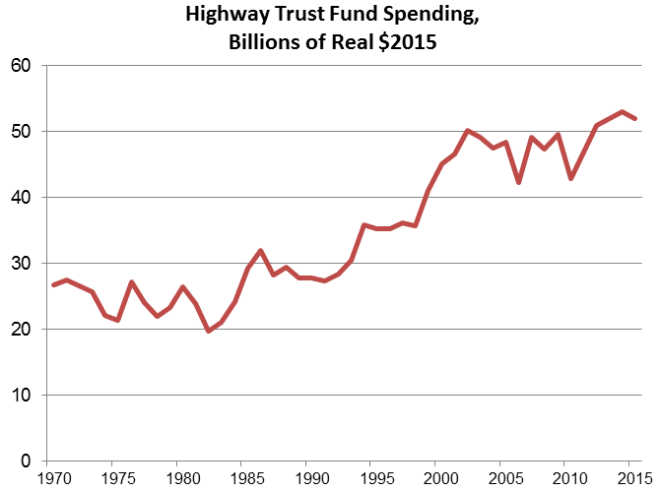 The federal gasoline tax of 18.4 cents/gallon brings in about $40 billion per year which goes into the Highway Trust Fund. But the HTF is spending $53 billion per year, meaning that federal gas tax revenue is being supplemented by $13 billion from general revenues. This additional $13 billion per year can be viewed as an unjustified federal expense merely adding to the deficit. Abolish the federal gasoline tax of 18.4 cents/gallon as of some specific date in the future, say in a year from the time such a law is enacted. Turn over all responsibility for highway construction to the states. States can then decide individually how much of the federal gasoline tax they wish to continue as a state gasoline tax in order to finance their own highway funding. Minimal federal guidelines could be maintained if desired to insure uniform quality control by the states. Of course, a $13 billion annual budget savings could be looked at as a drop in the bucket, not nearly large enough to make a sizable dent in the federal deficit (latest projection for fiscal year 2015: $426 billion). That would be too cynical. There are undoubtedly many other smart ways to cut back federal spending. I am constantly looking for them!